Raccontifantascienzaedintorni: "Science fiction can do anything literature can do, and then some." "Science fiction can do anything literature can do, and then some." 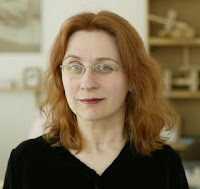 After her worldwide success novel "The time traveler's wife", and waiting for the movie based on it, Audrey Niffenegger reveals inedited aspects of the story. Eclectic personality, writer, artist, illustrator, creative writing teacher, Audrey released this interview on Dec 6th 2008. 2008, Francesco Troccoli, all rights reserved. Hello, Audrey and first of all thank you for your time. Let me express all my admiration both from a reader’s and writer’s perception. The TTW is really a great work, not only within a “genre” view. I know several people, including myself, who really enjoyed reading it and I am buying more copies as Christmas gifts. In an interview you said that “you were worried it would never get published as the title makes it seem traditional SF while it isn’t SF enough for genre-fans”. In Italian libraries you cannot find this book on SF shelves. It’s in mainstream. But I think it actually is SF, and I can say that SF fans are in love with the story. I know you do not consider important this kind of distinction, but can you tell us your perspective? I do think it is SF (after all, it is a time travel story) but the center of gravity is the relationship between the main characters, and the book is fundamentally an examination of a marriage. I think that the best science fiction has all the qualities of “literature” plus that extra, speculative thought-experiment aspect. SF can do anything “literature” can do, and then some. I am, but I never seem to be up on all the SF news; I’m just now getting around to watching the new Doctor Who series, for example. My current favorites are Kelly Link and Geoff Ryman. And H. G. Wells has been a major influence. Black Water, a collection of fantastic stories edited by Alberto Manguel, would be one of my desert island books. SF has often been a typical male territory, even if we know there are phenomenal female writers. And female SF writers are very different from male ones. Rhythm is calmer, even in dramas, and narration is smoother and sometimes more intense. And genre rules almost become an “excuse” for a psychological exploitation of characters and plot. I think it is also your case. Anyway, have you read any of them, like Lois McMaster Bujold or Ursula K. Le Guin? I read Ursula K. Le Guin many years ago, for a class in high school, actually. But I never got very into her work. I am an ardent fan of Susanna Clarke and also of Margaret Atwood. And what are your favorite mainstream authors? Of course, everyone I named above has been claimed by the mainstream. I would add Richard Powers, Wesley Stace, Henry James (who wrote ghost stories and time travel stories), Dorothy Sayers, Rainer Maria Rilke, Emily Dickenson, G.W. Dahlquist, Martin Amis, Edith Wharton, Virginia Woolf, Donna Tartt, and Chris Adrian. Let’s go to the story. I think the “paradox” of Henry meeting so many times a younger/older his self is a key factor in the plot. But on the other hand, this is completely different from the majority of time travel stories, where meeting yourself in the past or the future is a sort of “taboo”, which might cause alterations in the flow of time. What is your perspective? -because nothing can be changed, this story is a tragedy, and is true to life. Actually the book is dark and that it was even darker originally. Reading the story it seems there is a specific plot point where things start to collapse. Until then, anything was possible. Even a happy ending (which I know you consider artificial almost always). Henry loses his feet, he is trapped in the closet in the library (which he had always feared), and so on. That is the point where the reader starts feeling sorry because it is clear that he will die after being wounded in the hunting place. Did you explore any possible different end or was this given from the very first moment you started writing? I wrote the last two scenes of the book first. Henry’s death was always there, and in the process of writing I eventually figured out how it happened. Yep. That is what happens when you eliminate paradox (see above) and when religion does not figure into the equation. Well, in your website’s FAQ, You said you were raised catholic (like Clare in the book). Could this be connected with this sense of predetermination in some way? Catholics believe that God gives humans free will. Hence, the woman in the garden with the snake and the apple. Certain Protestant sects believe in predestination. Clare has a hard time accepting a universe in which everything has already happened, precisely because she believes in free will. Henry struggles to cultivate a sense of free will; he tried not to know what the future will bring so he can make choices freely. Yes, although she waited quite a long time for her happy ending. Is the disease Henry has something which might represent his sub-conscious? I mean, he always leave in emotional moments (his marriage, the birth of Alba), like he cannot sustain them. The time travel is meant to be a metaphor for memory, always glancing away from the present into the past. Can you comment on the importance of subconscious in human beings? It seems to me that subconscious is just another name for our real selves. We are like ice bergs; only the most superficial parts of ourselves can be seen by others. This is why fiction is so marvelous, it’s a way to get inside other people’s heads, to alleviate loneliness and to have impossible experiences. So much of what I write doesn’t make much sense to me as I write it; my subconscious is putting things together and I consciously understand later, when I edit. Can you share with us your personal definition of “fantasy”? To me Fantasy (in the literary sense) evokes elves and unicorns and such; Tolkien is my favorite in that realm, but I have not read very much and I know there’s lots of harder-edged Fantasy that I might like if I knew anything about it. And more in general, a definition of "fantasy" as a human attribute? Fantasy is all the purposeless, baroque, inchoate, pleasurable, and quite necessary thought we humans allow ourselves in the midst of our more sensible pursuits. Is writing the art you love more, among the ones you do? Can you also comment on you as an illustrator? The thing I love best is whatever I am working on at the moment. I am trained as an artist; I learned to write in school but mostly from reading other writers’ novels. So I am probably more versatile in visual arts, but I find writing more direct and easier. The director is Robert Schwentke. The movie is finished, as far as I know, and will be released some time in 2009. I am not involved with it, so I don’t really have any inside information. I hate people who comment on movies they haven’t seen (don’t you?) and since I have not seen it, I’m going to wait till it’s out before I say anything about it. I read your current job is teaching students how to write. This is gorgeous. Do you think (good) writing is more a talent or something everyone can learn? I do have a gorgeous job; I teach artists to write so they can put their art and writing together. My class is part of the Book and Paper Arts MFA program at Columbia College in Chicago, so the students are book artists. I think that most people can tell a compelling story, and most people can learn to be competent writers. Good writing requires sensitivity to the reader and that is one of the things a student can get from a writing class: a sense of whether they are having the effect they think they are having. Lastly, what is the status of you 2nd book, Her Fearful Symmetry, and the novella, The Chincilla girl in exile ? Her Fearful Symmetry is almost finished; it will most probably be published next fall. The Chinchilla Girl in Exile will become part of a short story collection, I don’t know when that will be done, but thank you for asking. Sometimes I think I am the slowest writer in the world. As far as I could understand Her Fearful Symmetry will be a sort of gothic novel, correct? Do you think SF readers will enjoy it? It is another genre-crossing thing: it’s a ghost story, and certainly partakes of the gothic in certain ways, but it is not particularly scary. It’s mainly about relationships forming and coming undone, about the difficulties of communicating even with people you know intimately, and about the dangers of getting what you want. Many thanks for your time, and Happy New Year. Thanks for the interview, it was fantastic!! Thank you very much for your comment, Elak!